Karina's Kreations: Coffee Talk Swap! This is a swap I made for our monthly coffee talk meeting. We try to get together once a month to share ideas and make fun projects. Kelly hosted this month and I'll show you her creation tomorrow. It's beautiful!!!! The card challenge was to do a 3" x6" card using a retiring card stock color. I chose to use Apricot Appeal. It's not a color I use that often but it's really pretty. 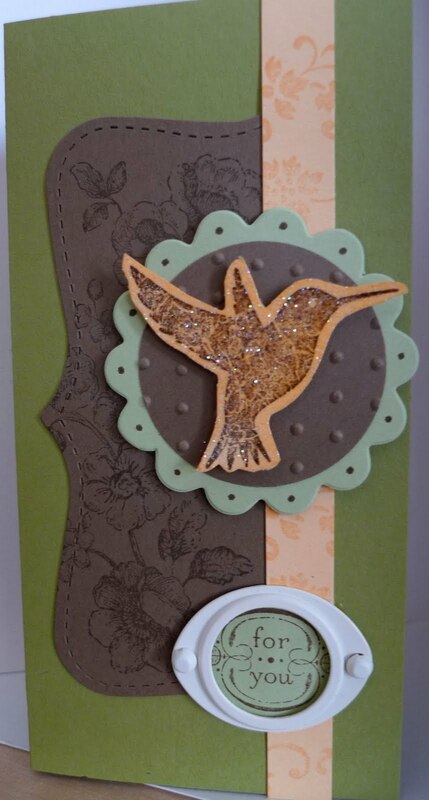 The card stock colors are Old Olive, Certainly Celery, Soft Suede and Apricot Appeal. I used the new stamp set called Elements of Style which I received FREE at leadership. I love the vintage look of this stamp set. I stamped the flower image on Soft Suede card stock that was cut out with the Big Shot die cut machine and the Top Note die. The vine image was stamped on Apricot Appeal card stock in Apricot Appeal ink. A 1-3/4" circle was punched out with the 1-3/4" circle punch and put in the Perfect Polka Dots Textured Impressions Folder and the Big Shot die cut machine. It was layered on a scallop circle made with the Pennant die and Certainly Celery card stock. The bird was stamped in Soft Suede ink on Apricot Appeal card stock and cut out. I rubbed VersaMark ink over it and embossed it with the Heat Tool and Iridescent Ice Emboss Powder. The greeting was stamped in Soft Suede ink on Certainly Celery card stock and punch out with the 3/4" circle punch. I added some Vanilla Hodgepodge around the greeting. I SO regret missing the meeting. Your swap looks beautiful!